When writing out their assignment there is actually very little that interests a student, other than the fact that they get it all done. However, simply ‘getting it all done’ is not the point of the assignment in the first place. In fact, teachers and professors give out assignments to students in the hopes of being able to assess them and whatever learnings they have managed to take back from the relevant lessons also. For this reason then, assignment writing does not just mean completing it anyhow, but also making sure that the student in question actually does a good job also so that when the examiner is marking the assignment, the student does not only score a pass, but actually secures a good grade as well! That is not to say that there is anything wrong with just sitting down with your assignment and finishing it. Anyhow. In fact, this is the first and most important mistake that students must avoid when writing out an assignment. Procrastination. The day they get an assignment, is usually a great day to get cracking on the work you have been asked to submit! Staying focused and on the topic that you have been handed is another problem area for most students who tend to digress. This happens when students become so involved in the writing out of their assignment that they lose thread of what the topic of the assignment may be about. Here, a plan can be of the best help as it will allow the student in question to actually figure out what they are going to put in their answers before actually starting the same. It also allows a student to stay more focused. Repetition is another tendency that students should work on avoiding because it only ends up detracting from the quality of the answer. 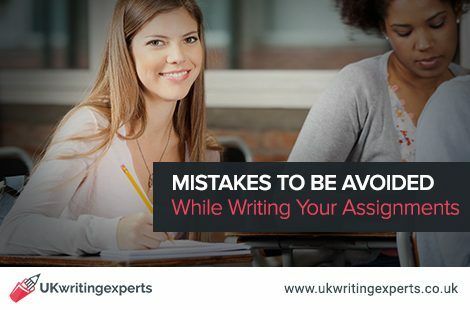 Again this is, one very common mistake that students tend to make, especially because they are so into their assignment writing that they forget to pay attention to anything else. Again, working with a plan can help to avoid this error. Spellings and punctuation, or in case the student is typing out their assignment, then typographical errors, are all some other mistakes that students make and which could very well be avoided, in the final draft of the assignment at least, that will also be handed in to the examiner, by simply proofreading and editing the work that the student has written. Similarly, all grammatical errors as well as any problems with the sentence structure that may have slipped into the assignment, can now be eliminated by simply proofreading the work. That is not all either. Proofreading after completing the work will also allow the student to assess the relevancy of their answer and judge whether the answer is finally ready to be handed in to the teacher. Finally, avoiding all the fluff is necessary. The word limit students are set is there to allow them to recount relevant facts and explain them accordingly. Most students however, add on a lot of fluff and very little of the facts making their answer very long certainly, but definitely not the best quality available. After all these tips, if you still feel assignment writing is not your forte, you can contact UK Writing Experts, a leading academic writing service providers for assisting you in your assignments.